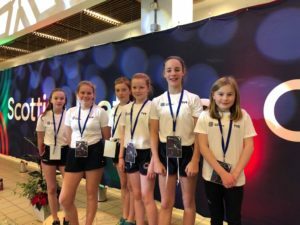 In early December a keen bunch of junior swimmers from the club volunteered to be box carriers at the evening final sessions of the Scottish National Short Course championships. They did a fantastic job, helping to make the finals run smoothly. 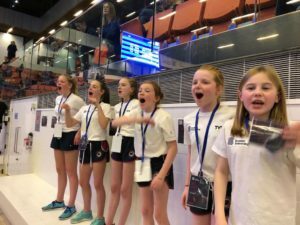 After their official duties were over they cheered on our own senior swimmers in the relays. They even managed to mix with some sporting superstars, getting t-shirts signed by Hannah Miley among others. Dan Wallace was so impressed he donated his silver medal to them. 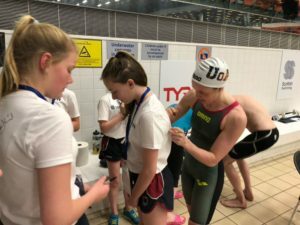 The girls are currently taking a turn each to look after the medal. Well done girls, great job! 2019 competition and social calendar - updated 06 March.